The passenger of this vehicle was killed when police say the driver crashed into a light pole in southwest Houston. HOUSTON (KTRK) -- A man has died after a violent crash on the Southwest Freeway. The fatal accident happened just after 9pm on the southbound feeder road in the 9600 block of Southwest Freeway near Bissonnet Street. 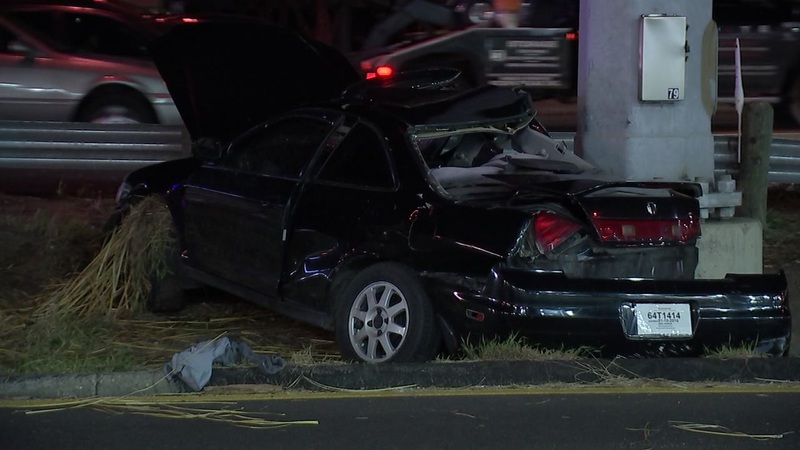 Two adult men were traveling in a Honda accord at a rate of speed when the drive lost control and crashed into a light pole, according to police. Both men were transported to the hospital. The passenger of the car was pronounced dead at the hospital. The driver is expected to survive his injuries. Investigators are not sure if alcohol played a role in the accident, which is still under investigation.